You don’t have to follow any linear rules when it comes to deck railings. Here, curvilinear powder-coated aluminum balusters eliminate the confined “jail cell” feeling that can come from old-style wood spindles. Railing caps are 2×6 boards, which are convenient for holding drinks and small flowerpots. A multilevel deck solves the problem of how to position a deck on a slope. Narrow-spaced wood spindles enhance this contemporary deck. Standard porch railings measure 36 or 42 inches tall. Wood is a sturdy option that can be stained to match the decking or house–or painted to create a color scheme all its own. 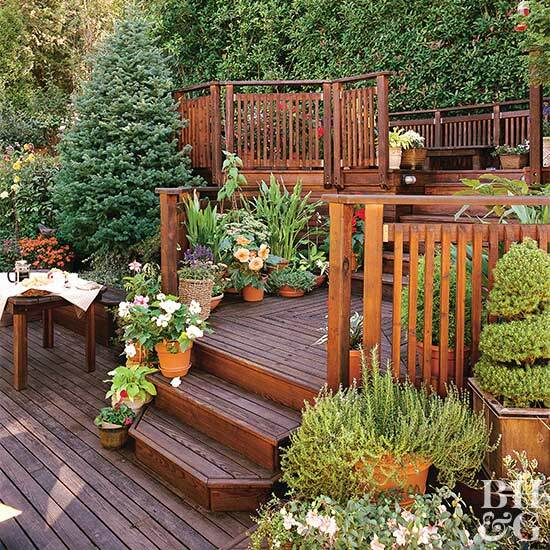 Dress up a standard wood deck with a style statement by choosing out-of-the-ordinary deck railings. 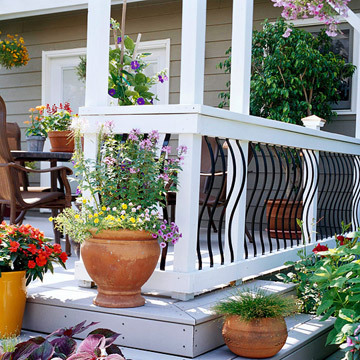 This deck features an elegant Chippendale-style rail painted a crisp, eye-catching white. 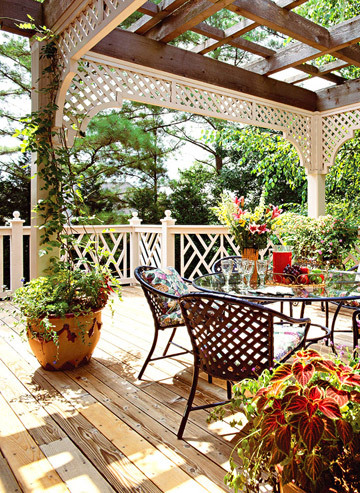 A matching white lattice valance on the overhead arbor adds a style enhancement to an otherwise standard deck.